Perma-Mend™ is a unique, easy-to-use UV* or sunlight activated, self adhesive repair patch. Made of fiberglass reinforced Polyester, it exhibits extremely good adhesion properties for long lasting repairs. Rated up to 2200 PSI when properly applied. Easy application- just cut, peel and stick. Comes in 3 sizes - 3" x 6", 6" X 9" & 9" X 12". UV Flashlight also available. Industrial Applications: Repair and maintenance of roofs, steps, tanks, pipes, lines, gutters, switch boxes, and more. Other Products by CRC Industries, Inc.
CRC 2-26® Multi-Purpose Precision Lubricant, a plastic safe lubricant, penetrant and corrosion inhibitor, helps prevent electrical malfunctions caused by water penetration, humidity, condensation or corrosion. CRC Smoke Test is an aerosol spray used to test the functionality of a smoke detector. It not only checks if the batteries are working, but it also tests for obstruction or debris that may clog the detector vents. 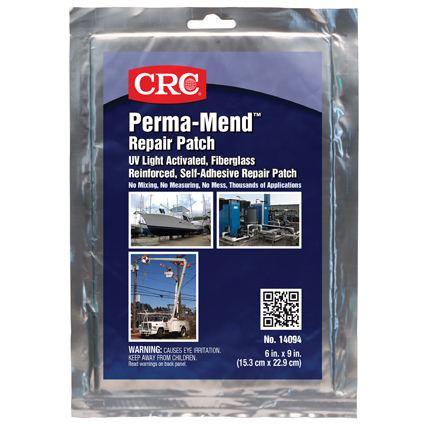 Perma-Mend™ is a unique, easy-to-use UV or sunlight activated, self adhesive repair patch. Made of fiberglass reinforced Polyester, it exhibits extremely good adhesion properties for long lasting repairs. Rated up to 2200 PSI when properly applied.